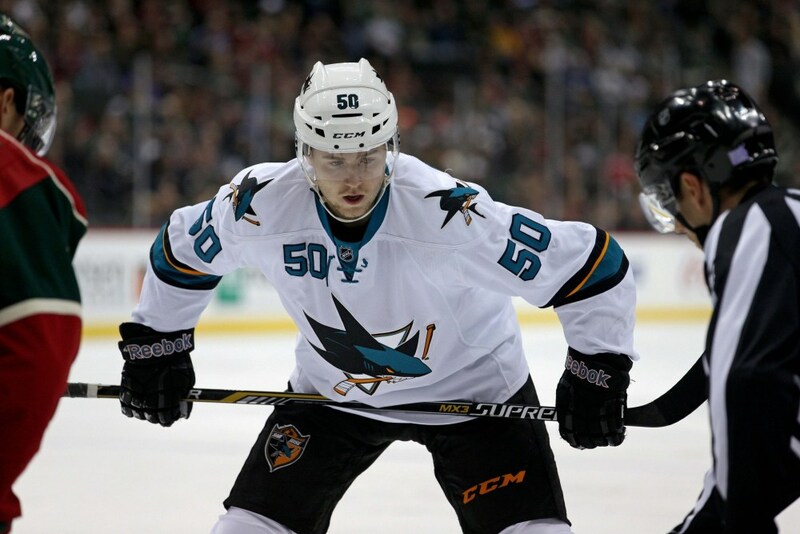 The San Jose Sharks have managed to pick up seven of the last eight possible points (3-0-1) and rookie center Chris Tierney is arguably the biggest reason why. The Keswick, Ontario native has four points over this span, all at even strength. Overall Tierney has tallied 16 points in 38 games and most of those have come since taking over the main third line center role for the departed James Sheppard. Despite playing in 19 fewer games and with less ice time, Tierney’s five goals and 11 assists already match what Sheppard was able to produce this season. As Sharks blog Fear The Fin points out, Tierney already leads the Sharks in a big time offensive category. Now some may be quick to point out the quality of competition is easier for Tierney not playing with those guys. However, it isn’t that simple of analysis. Tierney may not see as tough of matchups as the likes of Joe Thornton, Joe Pavelski, Patrick Marleau, and Logan Couture, but he also doesn’t get to play with as strong of linemates. A good example of similar production on either first or third line is Joe Pavelski. His numbers are pretty much the exact same overall regardless of where he plays. More goals on the top line with Thornton obviously, but about the same amount of points on either line. Even though it is a relatively small sample of 38 games, Tierney already looks like a sure bet to be a really good third line center next season and beyond. A couple of weeks ago I wrote about Tierney having nine points over a 14 game stretch and how a points per game rate around .5 is terrific out of a third line center. Perhaps though Tierney’s ceiling is even higher than that of third line center. He now has eight points in his last 11 games, a points per game rate of .72 which over a full season is standard Patrick Marleau territory. With the Sharks still fighting for an outside shot at the playoffs, a rookie center leading the push is quite phenomenal. Sure enough he has had a few poor clears in his own zone recently, but he is known as a smart, defensively aware type center. Those types of mishaps certainly aren’t the norm of Tierney’s game. While he still has some room to physically grow (listed at just 6’0″ 180) the 20-year-old is already looking like a full grown Shark in terms of production. He is already scoring at an incredible rate and that is with a face-off percentage of only 44%, so he is managing to produce despite not starting with the puck. Even with those couple of hiccups on clears recently, Tierney has been strong defensively. His goals against per 60 minutes is lower (read better) than that of guys like Joe Thornton, Logan Couture, and Tommy Wingels. Now again, Thornton and Couture have to face more dynamic offensive players. However, they also get to play those tough minutes alongside stud defenseman Marc-Edouard Vlasic. Therefore, goals against compared to teammates on other lines is still a pretty useful indication of strong awareness defensively. Not to mention, Tierney was voted by OHL coaches as the smartest player in the Western Conference last season. Given his incredible vision to read the game at both ends, Tierney’s ceiling may in fact be that of a second line shut down play-making center. It is doubtful that he has the makings of a future top line dominant center, but he is definitely showing the skill set of a second line center here down the stretch. Once he adds on about 15 pounds to his frame and gets a couple more NHL seasons under his belt, he could very well become a 50-60 point shut down center.